A cheesecake and beer pairing that few would refuse. Even when the cheesecake has a bit of a non-standard character. Perhaps even more so if this is the case…When it comes to pairing beer and cheese, you’d be hard pressed to find really bad combinations, most beers work well with most cheeses, but there are certain matches that have a stellar affinity for each other. The higher the quality of the beer and the cheese, the better the pairing. Read on for four impeccable matches. Hi, friends! It was Chris’ birthday earlier this week and we extended it to a few days as he was able to take some much needed time off work. The night before we left for a family skiing and craft beering trip I set up a cheesecake and beer pairing for him, featuring some of his favorite Belgian beers. Yes, I am totally calling my imperfect, somewhat clumsy looking cheese tower a cheesecake:) It was delicious and much appreciated. I can imagine it being a hit at parties (even if the drink of choice happens to be wine). Let me start by introducing the participant beers. They are all Belgian and with the exception of one fall under the Belgian sour and wild ales category. Three of them are lambic, two are Flanders red-brown ales and one is a mixed grain Belgian blonde ale. They were all available in our local liquor store, I didn’t have to search far and wide for them and I believe that they are reasonably easy to find in the imported craft beer sections of larger liquor stores across the nation. Lambics are spontaneously fermented beers, i.e. they are exposed to wild yeasts and bacteria present in the air of the Zenne Valley, Belgium. The very first ones are thought to have been made in the village of Lembeek, hence the name. There are several varieties of lambics. Some are fermented in the presence of fruit – Kriek (cherry), Framboise (raspberry), Cassis (blackcurrant) and Pecheresse (peach), while others, known as the style Gueuze are blends of young (one year) and old (over two years) lambics. Gueuzes are some of the most complex, elegant and ridiculously delicious beers on Earth. Both Chris and I would opt for a brilliant, effervescent gueuze over champagne if given the choice. Flanders red-brown ales are the world’s most wine-like beers in terms of flavor and are often called the Burgundies of Belgium. They are fermented by blends of Lactobacillus bacteria strains and unconventional yeasts (usually proprietary to the brewery), then aged in giant oak foeders for two plus years. Typically, to round off the flavors, a young Flanders red is blended with a matured one (ratios vary) and the final product is a complex, rich, oaky tannins kissed libation with a pleasant astringency, balanced by fruity notes and a signature dry finish. A veritable delight for the senses. The cheesecake and beer pairing I set up featured these particular beers. Framboise Boon – Boon is the name of the brewery in Lembeek that crafts this raspberry fruit lambic. Framboise is refreshing, well carbonated, with pleasant tartness balanced by fruity sweetness. Oude Gueuze Boon – The same brewery is known for their Gueuze. With the mouthfeel of champagne, this lambic blend offers a complex dance of faint spice, citrus, green apple, oak and funk. Delectable, it really is. It can be aged for many years. Lindemans Oude Gueuze Cuvee Renee – This Gueuze is a blend of 66% young Iambic and about 33% old Iambic. Once blended, the beer is subject to second fermentation in the bottle which is known as the Methode Champenoise (the same is true for the Oude Gueuze Boon and all other gueuze beers). In due time (usually six months) the Gueuze develops flavors reminiscent of dry vermouth, with faint citrus peel and grassy funk. Duchesse de Bourgogne – This Flanders red-brown ale is possibly the best known representative of the style. It is a blend of two ales, the younger one aged in oak for approximately eight months and the older one for eighteen months. With very noticeable tannins and fruity tartness mixed in with notes of chocolate it is reminiscent of sour cherry stuffed chocolate truffles (even though not as potent flavor wise). Rodenbach – This example of a Flanders red-brown ale has 75% percent young ale fermented in stainless steel blended with 25% matured ale, aged in oak foeders for two plus years. Brown sugar and sour cherry flavors dance together, the tartness is very faint, while the oaky smoothness is inviting and luxurious. Delirium Tremens – The only beer in our tasting that is traditionally fermented and with some bitterness to it. A Belgian strong pale ale with a punch of malty sweetness in the beginning followed by spiciness and tempting alcohol warmth. Slight tartness reminiscent of coriander. Get (or give) monthly shipments of rare beers from all over the world by joining the Rare Beer Club. As to the cheese selection… I must confess that I picked the cheeses for Chris’ cheesecake and beer pairing gift in sort of hurry. I only had about twenty minutes to shop and chose from the assortment of a single store. 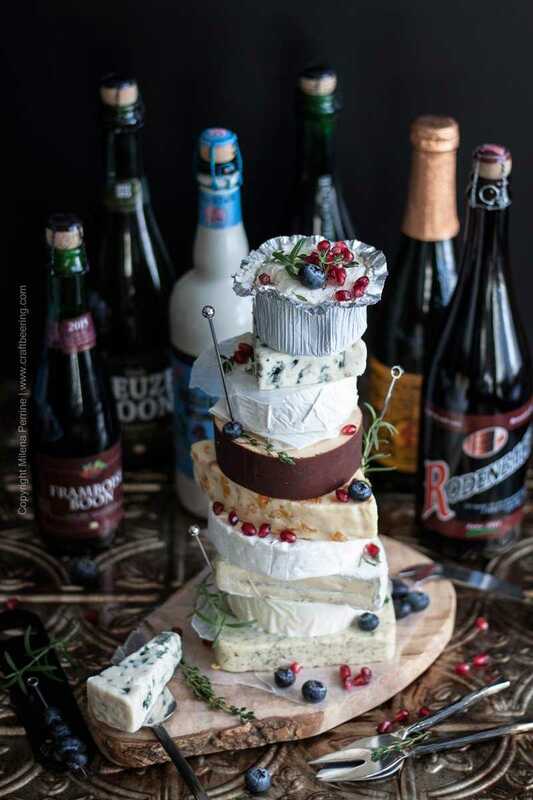 I did select several of the cheeses knowing that they’d pair well with the beers I had purchased, but I also bought a few ‘filler’ ones so to speak, for the sake of constructing the cake (hey, nobody’s perfect). Clearly Chris and I alone were not able to even put a dent into this beauty on the night I presented it to him. On the following morning we carefully packed most of the members of the improvised cheesecake and beer pairing, placed them in a cooler bag and with all due honors transported them to the refrigerator of the condo in the mountains where we stayed for the duration of our impromptu vacation. Every day after skiing we enjoyed (so glad that Chris shares:) a glass of Belgian beer and a few bites of cheese, followed by a soak in the rooftop hot tub, then hit a brewery on our way to dinner. Breckenridge Brewery was literally across the street from where we stayed and Outer Range Brewing Company and Vail Brewing Company a short drive away. It was a very relaxing vacation, rich in both exercise and indulgences. So grateful for unplanned (or minimally planned) vacation opportunities that turn into memorable experiences. And for our son being as smart, hard working and studious as he is wild and fun. His teachers never object to him being swept away by his parents to a vacation spot in the middle of a school week, with literally two days of advance notice. Cuvee Rene Oude Gueuze with White Stilton with Apricots (I could not get enough!! ), but in general geueze pairs well with Stilton and sharp cheddar. But mostly, if you have previously shied away from Belgian wild and sour ales hurry up and try some. 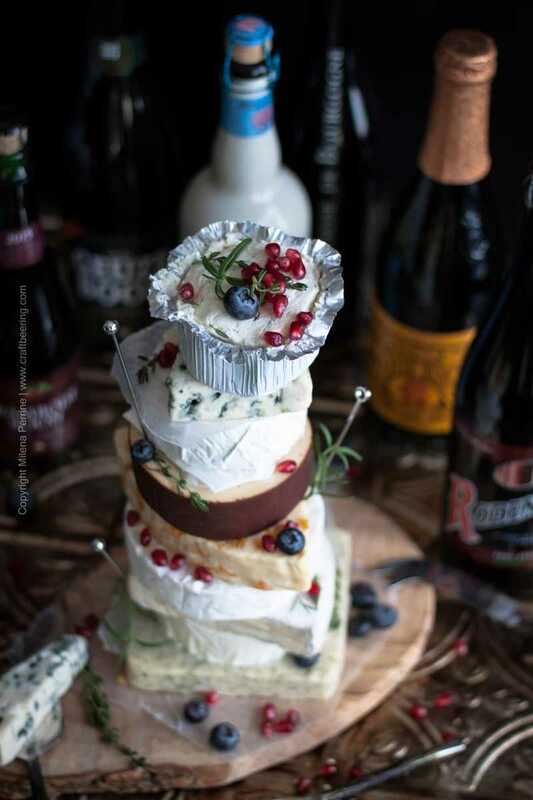 We guarantee that you will be happy to discover their divine qualities and while you are at it, why not construct a cheese tower and create your own cheesecake and beer pairing? We will definitely be including the concept in one or two future parties we’ll be hosting. PS. It is a royal pain to spell ‘gueuze’, right? For the record, neither one of us is a fan of the spelling, just the beer:). Now that’s my kind of cheese cake!! Thanks for sharing at the What’s for Dinner party – have a fabulous week! I’m not a huge beer fan, but these combinations sound really great! OMG, I’m totally drooling over all that cheese. (Also, in the Pinterest queue, and shared it with some friends) Thanks so much for sharing at the #happynowlinkup! How absolutely wonderful!! This Wisconsin girl can’t get enough beer or cheese! Just pinned so I can reference later!! Thank you so much, Kristin! Wisconsin girls are pretty savvy when it comes to cheese and craft beer, right? Happy birthday to Chris!! This is the kind of cheesecake I want. 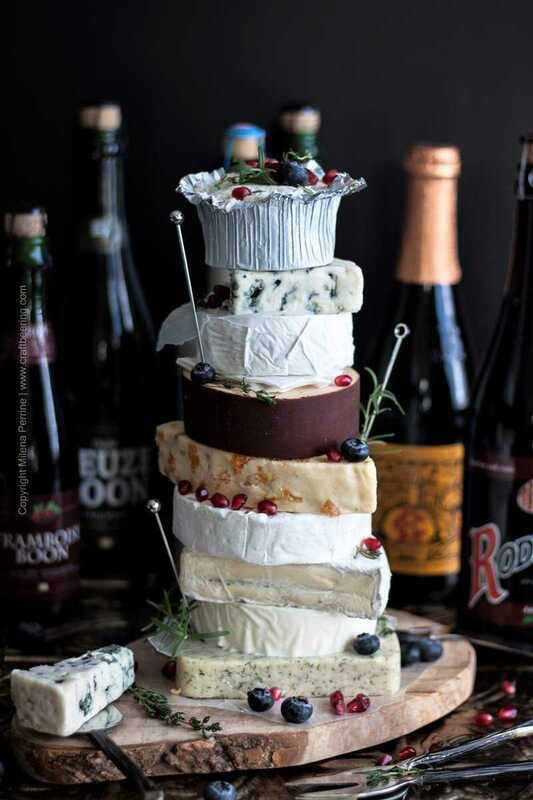 You know my deep love for cheese, so I’m totally swooning over this huge stack of gorgeous, yummy goodness…I haven’t had one I didn’t like yet (and the more pungent the better, lol). 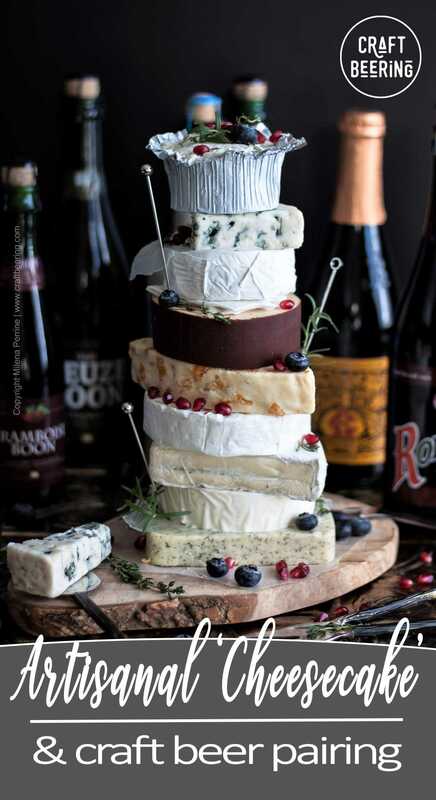 I always think of cheese with wine, but next time I’m trying beer 😉 …..twist me arm! Thank you, Dawn! We know about you and cheese:) Cheers! Thank you so much, Mary! Virtual cheers with a glass of gueuze! I want to party with you guys! Happy Belated Birthday, Chris! I know what kind of cake I’m asking for this year! Just stunning! Hehe! I bet whoever gets your cake request will be happy to oblige:) They will not need to bake and you can pair with your fave wines. 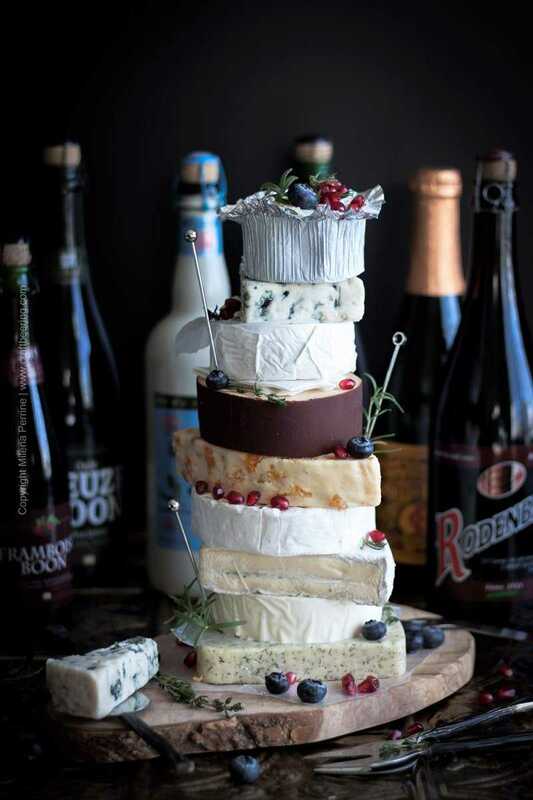 This is a cheese and beer lover’s dream come true! My eyes are popping out of my head a little looking at that lovely cheesecake :). I’m so glad you guys had a nice getaway and happy belated birthday to Chris! Thank you so much, Kelsie! Definitely enjoyed the time off and the birthday beer and cheese:) Have a wonderful week!